Investing in physical silver provides first time investors with relative security, as they know their investment is easily accessible and able to be transported quickly. Silver coins are a good investment for both first time investors, seasoned investors, and coin collectors. These are stored easily and are highly liquid. Government minted coins especially have high market liquidity, as interested buyers can be assured that they are receiving a quality product. Though the most popular coins include American Silver Eagles and Canadian Silver Maple Leafs, other government coins are equally precious. Among these are Austrian Silver Philharmonics. Music is a grand tradition in Austria and many commemorative edition coins have been minted honoring it, including one for Wolfgang Amadeus Mozart. The country of Austria has been minting Gold Vienna Philharmonic coins every year since 1989. These are special edition coins honoring the world-famous Vienna Philharmonic Orchestra and these have been frequently on the list of bestselling gold coins worldwide. After seeing how popular these were, the Austrian government sought to expand into silver. Since February 1, 2008; the Austrian Mint in Vienna has been minting the 1 troy ounce Austrian Silver Philharmonic as well. As with any other bullion coin, the silver content is 99.99% pure. The coin is 3.2 mm thick, has a diameter of 37 mm, and weighs 31.1 gram. The design of the coin is by Thomas Pesendorfer and is the exact same design as that on the gold Phil. On the obverse side is an image of the Great Organ located in the Golden Hall of Vienna, where the Vienna Philharmonic plays. The German words ‘1 Unze Feinsilber’ and ‘Republik Osterreich’ are inscribed on the front. This means ‘1 ounce pure silver’ and ‘Republic of Austria’. On the reverse side is a representation of the musical instruments played in the Vienna Philharmonic Orchestra, including a string bass, violins and cellos in the foreground and Viennese horn, bassoon and harp in the background. The year of mint and phrase Wiener Philharmoniker is also imprinted on the reverse side, meaning Vienna Philharmonic. The face value in euros differs from silver to gold- the silver coin is worth 1.50 euros while the gold can be worth 25, 50, 100, or 100,000 euros depending on its gold content. 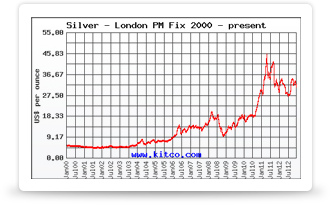 While the silver coin can be used as legal tender in Austria, it is primarily an investment coin. The Austrian Mint in Vienna does not typically print large quantities for circulation, and so production numbers are dependent on the demand for Silver Phils in a given year. Silver Phils can be ordered direct from the Austrian Mint individually, in tubes, or in monster boxes. Tubes and monster boxes are sold in what is called Brilliant Uncirculated condition and are completely untouched and new. Tubes include 20 coins each and monster boxes contain 500 coins in 25 20-coin tubes. Both of these are packaged tightly, giving you the option to take them out or leave them sealed. 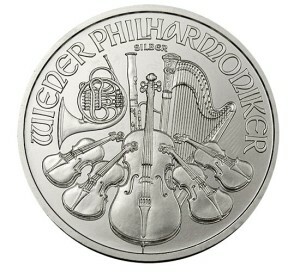 Austrian Silver Philharmonics are a brilliant investment to make because they are highly recognizable worldwide. It is the number one silver bullion coin across Europe and a perfect choice to add to an investment portfolio. The United States Internal Revenue Service acknowledges Silver Phils as an acceptable addition to an IRA.